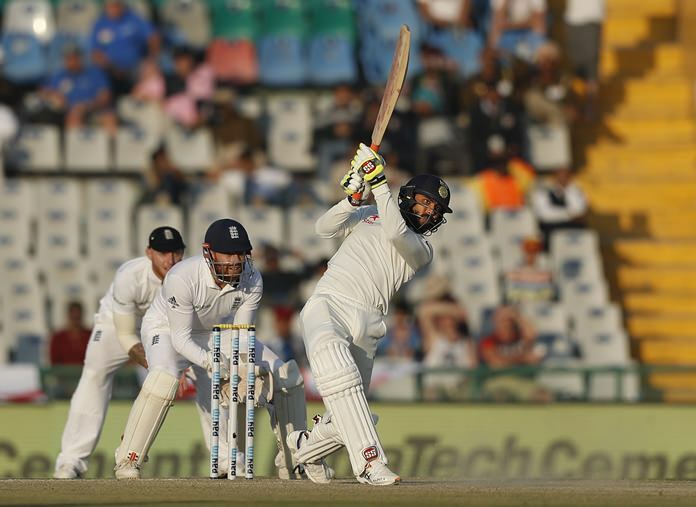 Mohali, India (AP) — India reached 271-6 in 84 overs at stumps on day two of the third test against England in Mohali. The hosts trail by 12 runs after the visitors were bowled out for 283 runs in their first innings. Ravichandran Ashwin was unbeaten on 57 runs, while Ravindra Jadeja was batting on 31 not out. They put on 67 runs for the seventh wicket and rescued their side from 204-6. “We will take 270-6 at the end of day. We bowled exceptionally well as a team and stuck to our bowling plans. We got our rewards at the end of day. They got a partnership going but that happens in cricket,” said Adil Rashid, after the day’s play. The leg spinner has so far taken 16 wickets in three tests, and is the leading wicket-taker of the series. After tea, India lost three wickets for eight runs in the space of 19 balls. Cheteshwar Pujara (51) was caught in the deep off Rashid (3-81) off the second ball after the break. Rashid also trapped Ajinkya Rahane (0) lbw. The batsman went for a DRS review, but the decision was upheld. Debutant Karun Nair (4) was then run-out, after a mix-up with Virat Kohli (62) as Jos Buttler hit the stumps directly from point. India’s collapse saw the home side slide from 148-2 at tea to 156-5. Kohli then put on 48 runs for the sixth wicket with Ashwin. He reached his 14th test half-century off 111 deliveries. Kohli was later caught behind off Ben Stokes (2-48). In all, he faced 127 balls and hit nine fours. Before the close of play, Ashwin reached his ninth test half-century off 77 deliveries. Ashwin and Jadeja played a few handsome strokes before the close of play, and helped the scoring rate along. Thanks to their partnership, India were able to nearly draw abreast of England’s score. “We recovered really well. We have an advantage as both our all-rounders are still batting. Tomorrow the first session will be crucial. Our lower order has been contributing well throughout the series. We will look to take a lead of 75-100 runs,” said Pujara, after the day’s play. Earlier, Pujara and Kohli had added 75 runs for the third wicket. Pujara had reached his 11th test half century off 100 balls, inclusive of eight fours. “It was a crucial partnership. We were leaving balls outside off stump. Second session was good for us. We were not struggling (with the scoring rate). I felt England were bowling negative lines,” said Pujara. Parthiv Patel scored 42 runs on his test comeback and gave India a good start. He was trapped lbw by Rashid after lunch. His opening partner Murali Vijay (12) had earlier fallen cheaply to Stokes, out caught behind. James Anderson (0-36) had made a bizarre appeal for obstruction of throw against the batsman, who stood his ground, but the umpires turned it down. This was after Mohammed Shami (3-63) struck twice to bring a quick end to England’s innings, who had started from 268-8 overnight. Shami had Rashid caught behind and then trapped Gareth Batty lbw. India lead the five test series 1-0.